Today’s piece comes from Joe Berisford. 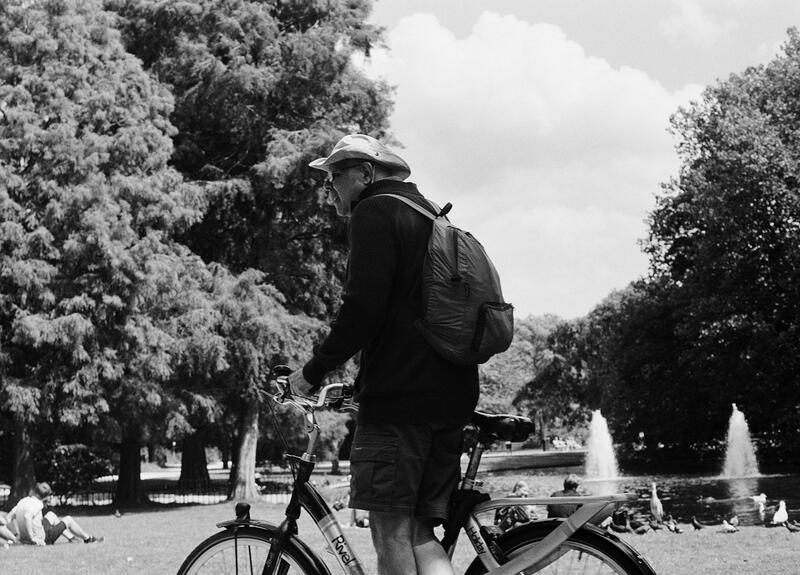 Joe takes us on his trip to Amsterdam, a city that reinvigorates his spirit for creating images in a more simplistic fashion, focusing on things as they are. The buzzing European city live is a polar opposite to his small town vibe back in England, which seems to drive his image creation in finding that same small town feeling by freezing moments in time in a much, much bigger city. 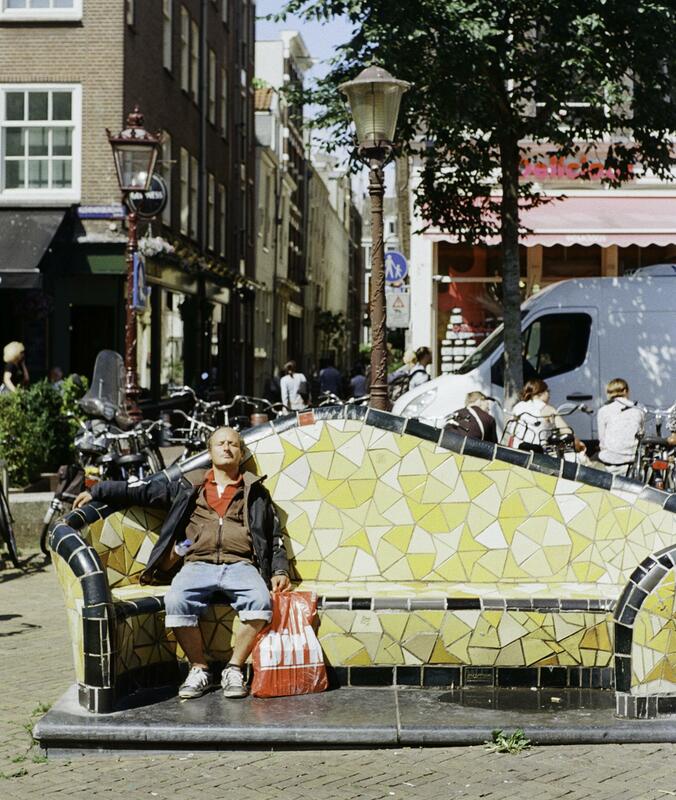 After stocking up on a dozen or so rolls of film, I headed to Amsterdam. Being my second time, I wanted to capture the essence of the city and leave behind the typical tourist photography in England. Feeling inspired and ready to shoot, I was hyped as I landed at Schiphol Airport. The style of photography I normally shoot is a very documentary style (coming from a film-making background), so I always try and capture stories within the pictures I take. Luckily, Amsterdam kept serving this moments to me on a silver platter. The first thing I noticed was that the city was ripe and alive with characters dotted everywhere. People that standout from the crowds, people that’re unique and full of personality. I felt like I had to take advantage of this. In many instances, I took photos that essentially created themselves. Whilst walking along the canal side, I was asked by a friend of mine how I take a picture and the thought process behind it. I simply replied: “It’s being in the right place at the right time”. 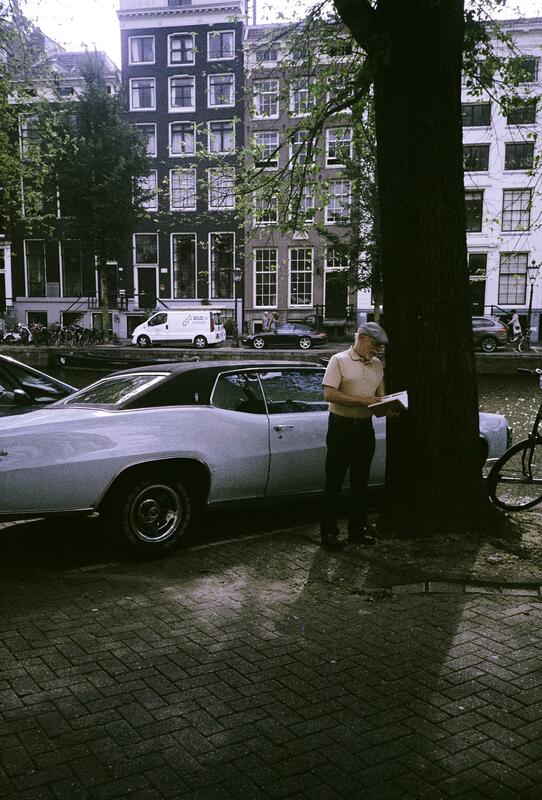 As I said that, a man proceeded to lean against the tree with his book standing next to a beautiful vintage American muscle car. I knew before developing the film that if my trusted Olympus XA1 had captured this moment, it was going to be one of my favourite shots from the roll. It came out exactly how I saw it in the streets. 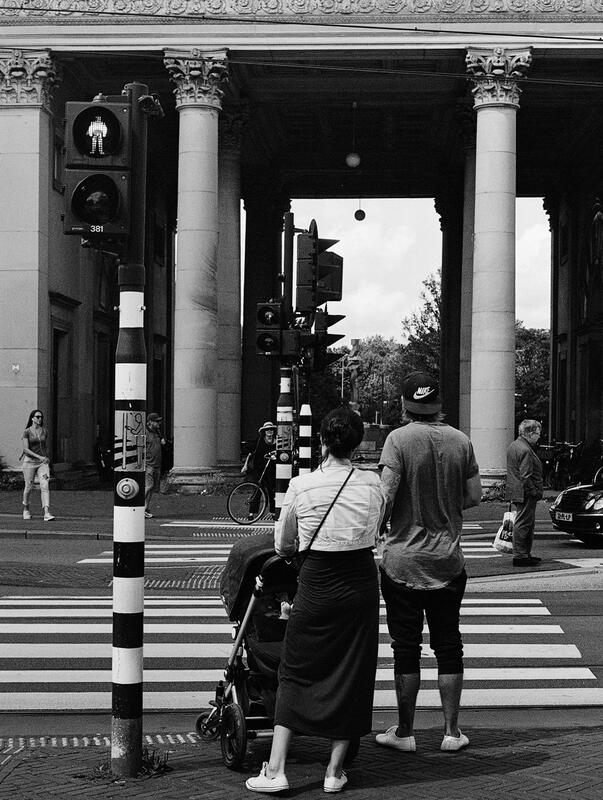 I felt like after this moment, Amsterdam kept throwing more opportunistic moments for me to record, teasing me as I knew I’d have to wait to get them developed. 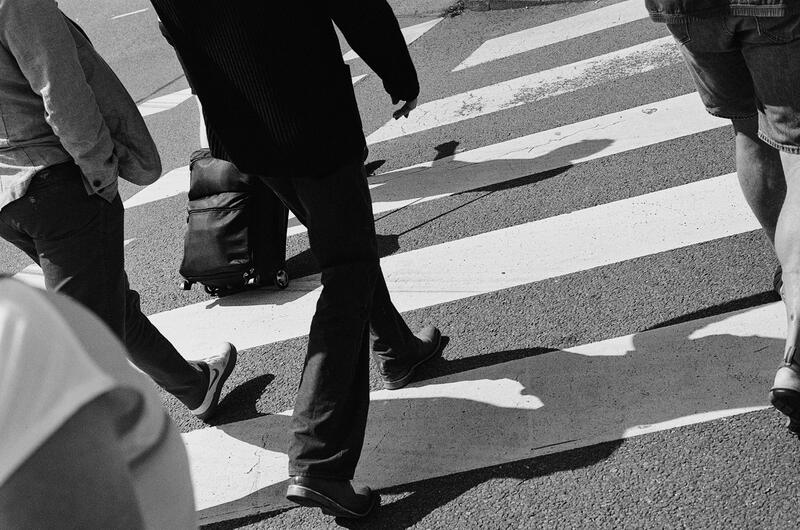 On the first day, I concentrated on the people of the city and tried to capture their thoughts and feelings into a photograph. 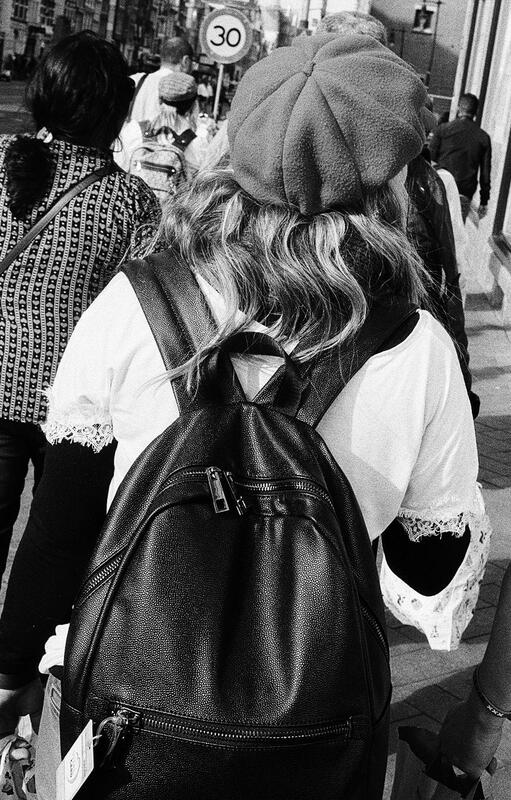 Something I’ve always found interesting is taking pictures of crowds of people and getting certain individuals to stand out, and this is something I took advantage of being in one of the busiest cities in Europe. 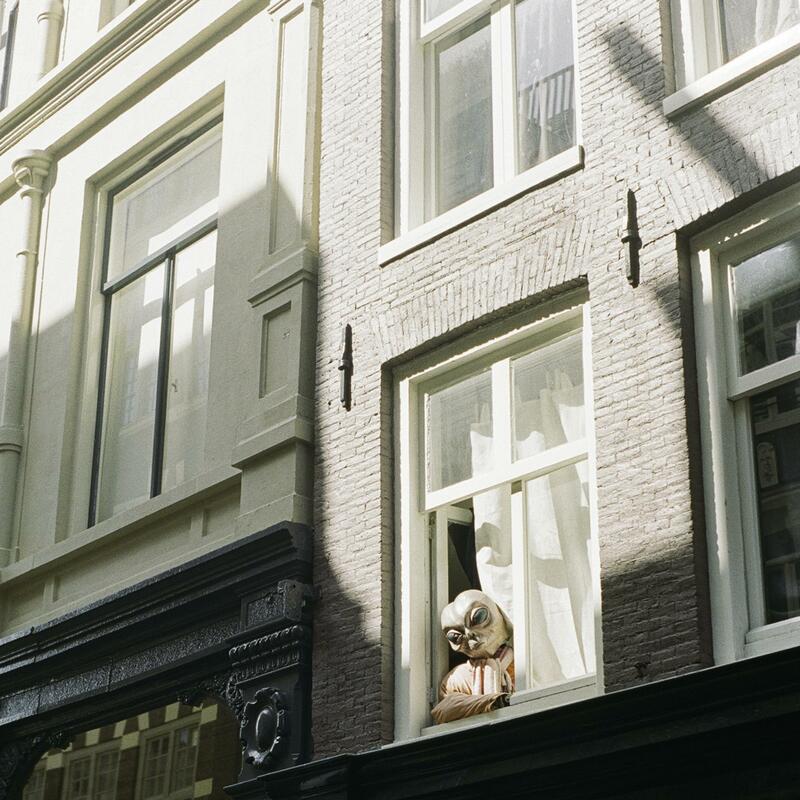 After shooting exclusively black and white for nearly a year, I decided to take mostly colour film to Amsterdam this time around and I’m so glad I did. After purchasing a roll of Ektar 100 in one of the side street camera shops in Central Amsterdam, I was on the hunt for the colour red. 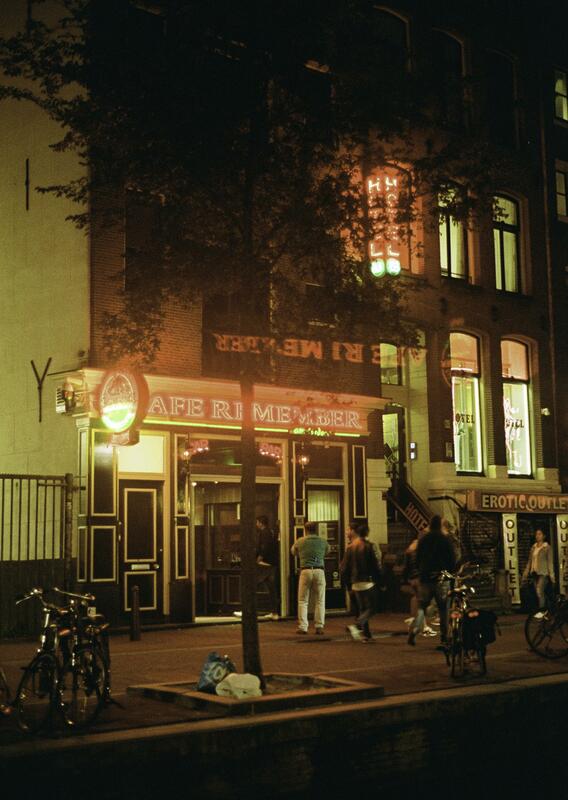 Being Amsterdam, everybody knows about the infamous “red lights”, but that wasn’t the only red I was looking for. People really dress to impress in Amsterdam, with a sense of style and swagger everywhere you turn. 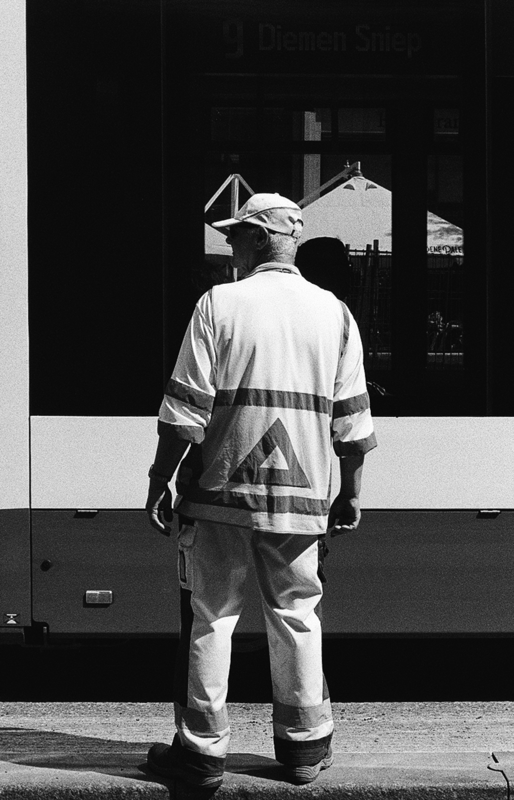 Highlighting a single colour in a picture is something I’ve found so interesting to shoot. By highlighting the colour, you’re picking up on a single person in a crowd not for how they look, not their ethnic origin, but for the colour of something they’ve got with them, and it interests me to shoot this. After encountering a man asleep on a bench with a bright red bag I had to keep shooting. I was mainly was overexposing Ektar and underexposing Portra. It gave me some incredible results. After shooting people in crowds, I also love shooting subjects that’re in a lot of negative space in an image, and Amsterdam is where I’ve yielded some of my favourite photographs of all time. 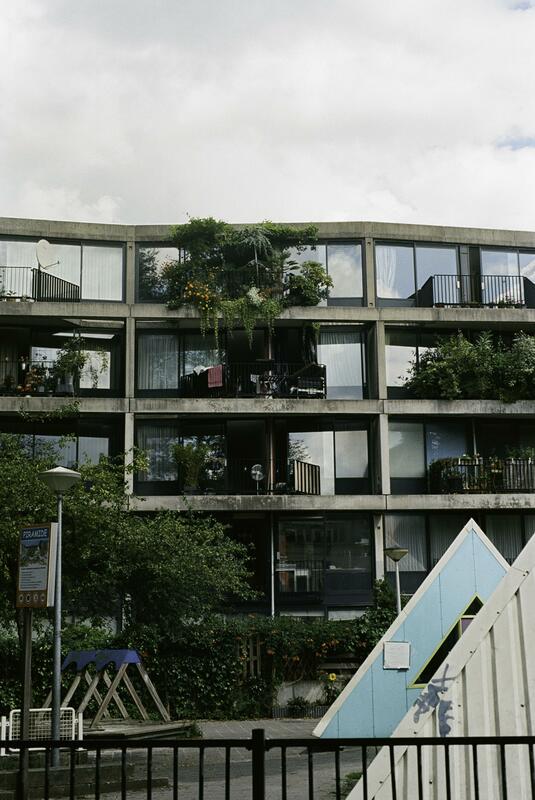 Pictures like the Alien in the Window and the Girl in the Pond are some of the shots that I’ll never forget taking. After walking through the central of Amsterdam after having a bite to eat, golden hour was in full flow allowing the light to take over. After noticing the little grey dude hanging out of the window, I honestly took the picture as a bit of a meme. Getting home and seeing how the photograph turned out really made me smile and it’s one of my personal favourites from the trip. 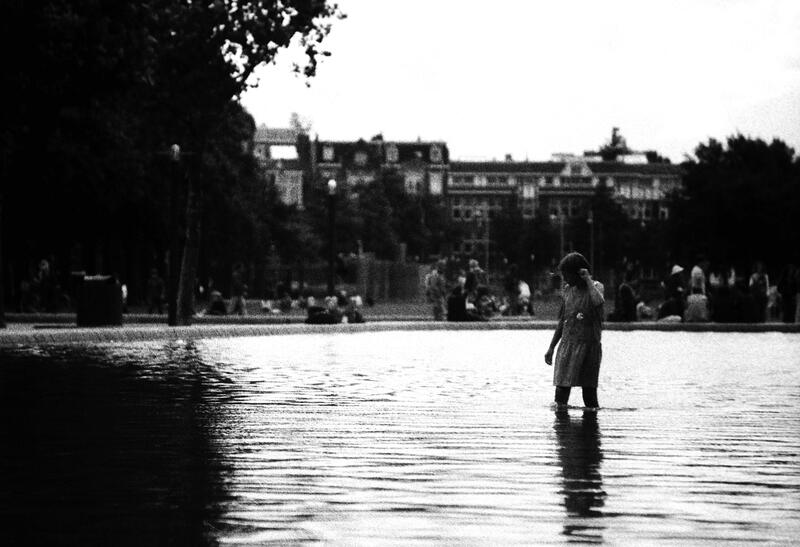 The girl In the Pond is the only photograph featured that’s from my first trip to Amsterdam, but for me, it’s a timeless picture. The fact that this girl was so elegantly dressed and was the only one in the biggest paddling pool in the heart of Amsterdam at the time I took this picture was truly a right place at the right time moment. I’ve been slightly obsessed with this picture for nearly two years but for me, it’s a wonderful image that I’m glad I good capture. Getting the rolls back from this trip was truly amazing for me. After planning this holiday for so long, spending time with my best mates, and capturing some of the work that I’m most proud of was a successful few days. Amsterdam is somewhere full of opportunities for timeless photographs and it allowed me to shoot in a way in which you just can’t in a small town in England.